After reaching a multi-year low a year ago, the Fidelity Select Gold Fund (FSAGX) has now decisively advanced past a treacherous up and down trading range and started the initial stage of a potentially long-term new bull market. The first rally came in August 2013, which signaled the end of the bear market for the gold sector. However, prices unexpectedly reversed the bullish trend in September following the highly publicized selling of gold assets by hedge funds, which also coincided with low inflation expectations. In December, gold stocks revisited the June lows, but were able to hold this level creating a chart pattern that is known as the double bottom. From the December low the sector rallied strongly and has been making higher highs and higher lows, which is one of the hallmarks of a bullish trend. As the result, the Fidelity Select Gold Fund (FSAGX) is the best performing Fidelity mutual fund so far in 2014 with an outstanding 35.11% return. We must caution investors that the gold sector can be highly volatile and investing in gold stocks is often regarded as highly speculative. Investing in the broader natural resources sector provides more diversification and may be more appropriate for a conservative portfolio (read more on the Fidelity Natural Resources Fund). The Dow Jones Industrial average moved above the psychologically important 16,000 level today, the first time in the history of the stock market. This is clearly a sign that the great bull market of 2013 is still intact. As we approach the seasonally strong December, it is worth taking a closer look at where the market leadership is coming from. The table below shows the top 10 Fidelity mutual funds ranked by momentum, courtesy of FidelitySignal.com. 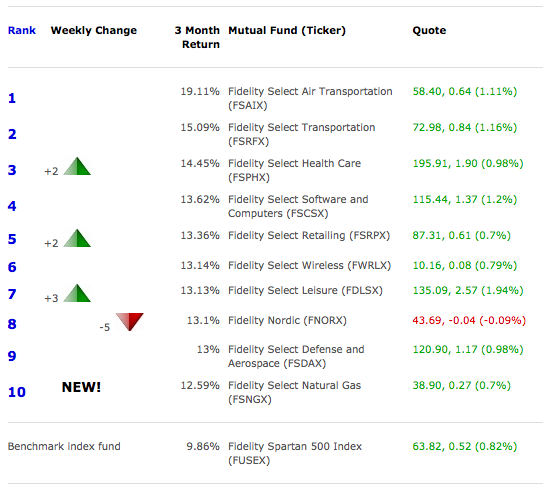 The table shows that the Fidelity Select Leisure Fund (FDLSX) is moving up the fastest in the momentum ranking. In addition, FDLSX had the largest gain today out of all Fidelity mutual funds. The ranking also shows that today’s rally is broad based, which usually is highly bullish for the stock market. The Fidelity China Region Fund (FHKCX, last change: 1.08%) is currently the best Fidelity mutual fund, based on the fund ranking provided by FidelitySignal.com. The increasingly positive tone of the news in the last three months suggests that that the Chinese economy is in a better shape, than previously thought. As the result, the Chinese stock market has entered into a strong bull market. The Fidelity Small Cap Enhanced Index Fund (FCPEX, last change: 0.34%) is the best performing diversified Fidelity fund with 14.37% three-month return. The steeply rising price on the FCPEX chart may signal that the market is reaching an overextended phase and a correction is becoming increasingly likely. The Fidelity Select Automotive Fund (FSAVX, last change: 1.47%) has moved to the number one position in the FidelitySignal.com Top 10 Ranking of Fidelity mutual funds with a solid 20.84% 3 month return. Gold bullion (see the GLD ETF) broke above the already steep uptrend resistance line and accelerated to a break-neck speed. 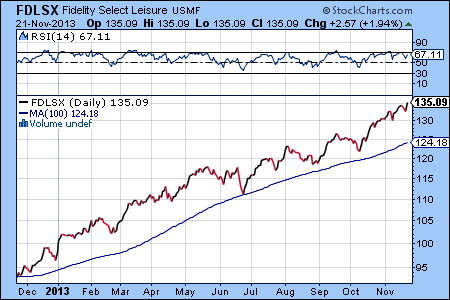 The uptrend of the SPDR Gold Shares (GLD) ETF is accelerating. The Fidelity Select Gold fund (FSAGX) closed up 2.19% on Friday and was the best performing sector fund. However, the price pattern of FSAGX shows divergence compared to GLD. FSAGX will need to break above the April highs to resume its uptrend. It is also possible, that the divergence is an early warning, which signals that the speculative bubble in gold bullion will not continue on the long term. The Fidelity Select Gold fund (FSAGX) is up in a weak market, but still in a trading range.